, the fourth daughter of sir Anthony Cooke, was born about the year 1530, and like her sisters became famous for her knowledge in the Hebrew, Greek, and Latin tongues, and for her skill in poetry. A short specimen of her talent in. that art has been preserved by sir John Harrington and Dr. Thomas Fuller; but there is some difficulty in determining the occasion upon which the verses were written. Sir John Harrington says, that her design in writing them was to get a kinsman of hers sent to Cornwall, where she inhabited, and to prevent his going beyond sea. 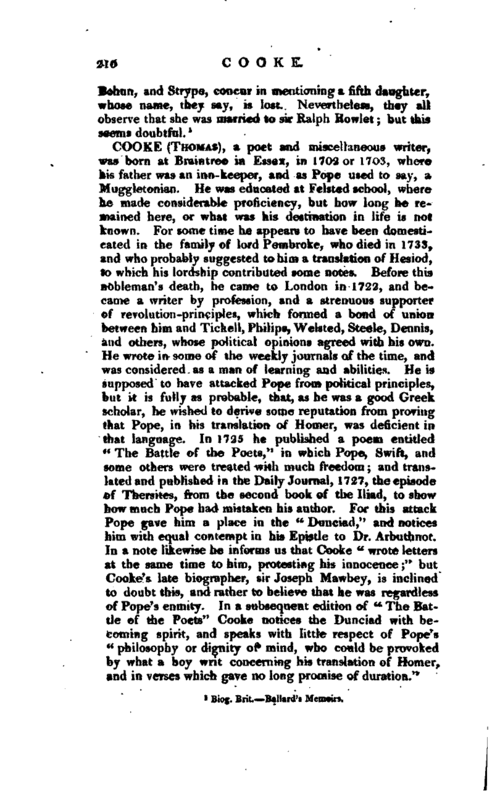 Mr. Phillips, in his “Theatrum Poetarum,” asserts that it was her lover. 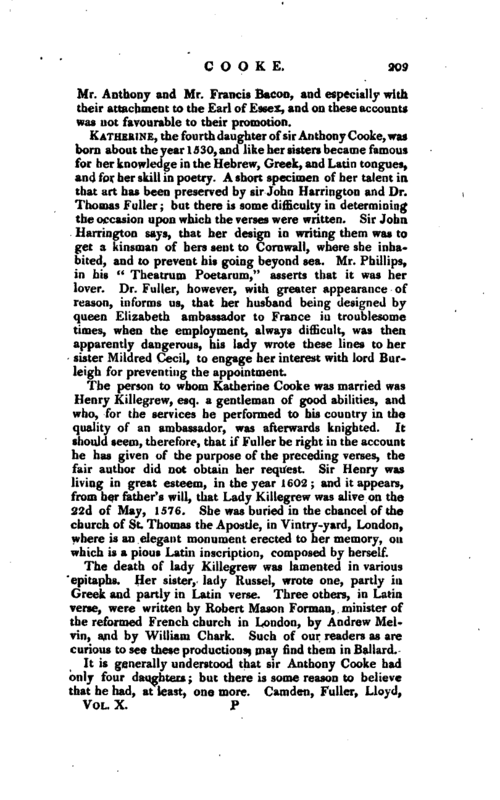 Dr. Fuller, however, with greater appearance of reason, informs us, that her husband being designed by queen Elizabeth ambassador to France in troublesome times, when the employment, always difficult, was then apparently dangerous, his lady wrote these lines to her sister Mildred Cecil, to engage her interest with lord Burleigh for preventing the appointment. The person to whom Katherine Cooke was married was Henry Killegrevv, esq. a gentleman of good abilities, and who, for the services he performed to his country in the quality of an ambassador, was afterwards knighted. It should seem, therefore, that if Fuller be right in the account he has given of the purpose of the preceding verses, the fair author did not obtain her request. Sir Henry was living in great esteem, in the year 1602; and it appears, from her father’s will, that Lady Killegrevv was alive on the 22d of May, 1576. She was buried in the chancel of the church of St. Thomas the Apostle, in Vintry-yard, London, whiTe is an elegant monument erected to her memory, on which is a pious Latin inscription, composed by herself.